The Festival ran for three nights on June 4, 5, and 6 at the Boston Playwrights’ Theatre, 949 Commonwealth Ave, Boston, MA 02115. 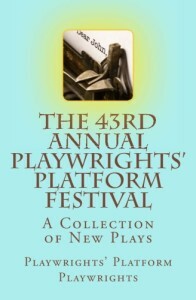 For the first time in our history, we offered a published compilation of plays from our festival, now available at Amazon: 43rd Annual Playwrights’ Platform Festival: A Collection of New Plays. Hortense Gerardo, Honorary Board Chair and one of this year’s featured playwrights, had the initiative and leadership to bring this idea to fruition. All proceeds from sales of this book directly support the Playwrights’ Platform.